On the one-year anniversary of Prince’s passing, Day opens up about the virtuoso’s art and immortality. Prince was a legend as enigmatic as he was spectacular. Molded by inextinguishable passion and discipline, he produced a full-bodied discography that reinvented what it meant to be an artist. His influence oozed into the work of many musicians, so his untimely death triggered an outpour of tributes and remembrances, all attempting to answer the same question: How should we remember him? Although he vividly recounts the moment he got news of Prince’s death, an optimistic lilt remained in his voice. He punctuates each memory with laughter, a subtle reminder that Prince Rogers Nelson will never leave the hearts of the fans, family, and friends he left behind. 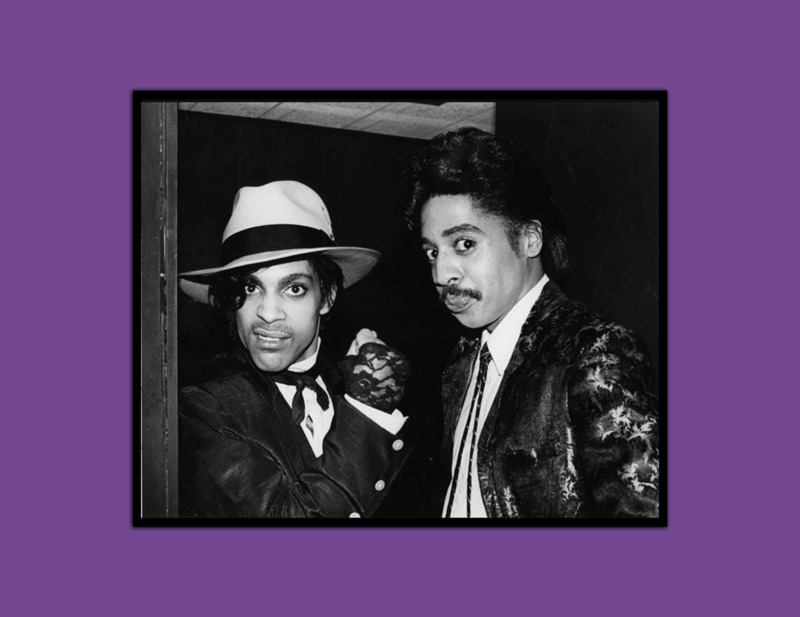 Listen to “Over That Rainbow” and read our conversation with Morris Day as we remember Prince. How did your Prince tribute “Over That Rainbow” come about? There’s a lot of very deliberate detail packed into the song, even down to the rainy outro. I was just really working on some other music when the whole thing happened. I was working with a team of people and they presented me with that and it just had the right feel so we put it together. It just kind of had a life of its own, the song just kinda came together. You say they presented you with “that”? What did they present you with? With the song basically. Matter of fact, I had to listen to it and listen to it, and when I first heard it I was like, “Eh, I don’t think I can put my emotions out there.” You know? I listened and it grew on me. So then we kinda tweaked it. I put my own thing on it and we cut it. It was a journey — it was an emotional journey to record that song. I was really hard on myself about the emotion on the song and I didn’t think that it was good, and then I finally quit beating myself up about it and listened to it. Then I loved it. In a Billboard interview, Andre Cymone recounts how he, you, and Prince met back in ‘73 or ‘74, saying: “[Morris] put on Tower Of Power’s ‘What is Hip’ and played it lick for lick. [...] Prince heard him and we all jammed.” Do you remember that moment and if so, what did it feel like? What was the energy like, jamming with Prince for the first time? Well, it was really cool because I had known Andre for some time — he and I went to high school together and I had seen their band Grand Central. I just couldn't believe these guys. They were like 14, 15 years old playing like they were in their 20s, their guitar solos, their musicianship. I had never seen anything like that from young musicians my age. I kinda just started following them around, and then Andre and I got to know each other. Finally, we skipped school, and any time I skipped school I would go home and play my drums. He came by and I had my drum set up and my big speaker behind it. I always jammed, personally, to Tower of Power because Dave Garibaldi is one of my personal favorite drummers. I put “What Is Hip” on and I played it, like he said, lick for lick because I was an addict, and he was just sitting there staring at me with his eyes all stretched. He was like, “Man I didn’t know you could play like that.” And then, apparently they’d been having some problems with their drummer at the time, Charles Smith, Prince’s cousin, not showing up to rehearsal and stuff like that. So I went over and we jammed and they heard me play. That was it — my drums never left the rehearsal hall. What do you think you taught Prince over the course of your friendship? And what did he teach you? If anything, I probably helped him lighten up in life, helped bring about the comedic side, which he’s a real comedian in his own right. But he taught me, as did Andre, about being a serious-minded musician. Before I got with them, I was serious about my drums, but when I got with these guys, we started doing gigs. We would run home to watch "The Midnight Special" and "Don Kirshner’s Rock Concert" and all those shows, and all we talked about was when we make it. Not if we make it, when we make it, when we get famous, we’re gonna do this, we’re gonna do that. It was like I found my stride. I found the clique that I had been looking for, because I didn’t really feel like I fit in so much in high school until I got in this band. They were so serious-minded and he taught me how to take the music serious. Every friendship has its ups and downs. How did you and Prince deal with yours, and how did you ultimately repair any tensions? Like I always say, family fights. You can live in a house with your brother, your sister — you’re gonna fight. Some of them last longer than others so we had our disagreements but with the same token, when we saw each other, even though there would be things that I might be pissed off about or he might be pissed off about, because we had still business on the table that we had to deal with because we did a lot of music together. Ultimately, like I said, when we saw each other it was just like the last time we had talked was yesterday. So I mean, we got past it. What is your fondest memory of you two? Back in the musical days, it was a lot of good memories. Some of the moments in the studio — like we did a b-side to “Tricky.” We had heard Bootsy and Parliament Funkadelic had talked about us on the record and said something like, “Morris, Morris, meow meow” and kind of eluded to, back then, that maybe we kinda copied some of their style. So we went right in the studio that night and we did our rebuttal. It ended up being a B-side, but we got such a kick out of it. We laughed a lot that night because we were just, off the top of our heads, coming up with stuff to fire back at them. It ended up being pretty funny. Who were you guys responding to? It was George Clinton and Bootsy Collins. Prince waged war with the music industry throughout his career. Did you see where he was coming from? I understood him. He was very rebellious in that respect. I definitely understood where he was coming from; it made perfect sense. The amount of money the companies earned off of us and the small amount we saw, it all made sense. And then, owning all of your masters and basically owning your likeness and image and everything. I certainly understood that. Did it necessarily impact you? Even as you were making your own music, did you feel compelled to rebel as well, or was it something you simply agreed with? I agreed with it. If anything, it probably cost me money because he was left amenable to thinking music and making the money off of the songs we could’ve made. A lot of people requested to use the songs; they’d get a big fat no for his portion. Maybe down the line it makes sense, but through that whole period, if anything, it was more difficult to license the music that we both wrote on. Where were you when you found out he died? What was your initial reaction? I was on a layover in Chicago on a flight from Las Vegas headed to Orlando. I got a call from a buddy of mine asking me did I hear what happened? They hadn’t clarified it yet and I didn’t know. I was like, “Yeah I heard the story that somebody, one of the employees at Paisley Park had passed away.” And he’s like, “No, I think it was him.” I said, “You're lying to me.” It didn't even sink in. Then I verified that it was him but it still didn't even sink in until later on, late that night. It hit me like a ton of bricks. What was going through your head? Were you in denial? Yeah, I think I was pretty much in denial. I wasn't even on that page. It didn’t hit me for real. Then the history and how far we go back — you’re not thinking that on the surface right away because there’s no reason to, and then all of a sudden, my mind started reflecting. Then it kinda hit me real hard. If you could have said anything to him before he passed, what would have it been? Bye. You know, hold it down ‘till I get there. What do you think the public tends to get wrong about Prince? I think everybody has their own perception and usually, from the eyes and mind of a fan, it’s perception. Everybody’s entitled to that, their perception. I think a lot of people really don’t know anything about him at all, just what he allowed of himself — which, to me, was just a small portion of who he was. 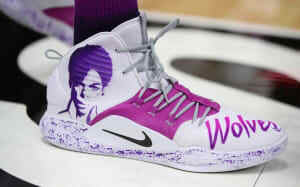 How will you remember Prince? I had the rare opportunity of having someone who was truly great be my friend — who was my friend and a person, not an image or an entertainer that you see on TV. Just somebody I knew who just happened to be one of the greatest musicians ever. Everybody should listen to “Over That Rainbow” and walk down that road with me, down memory lane. "Over That Rainbow" is out now.